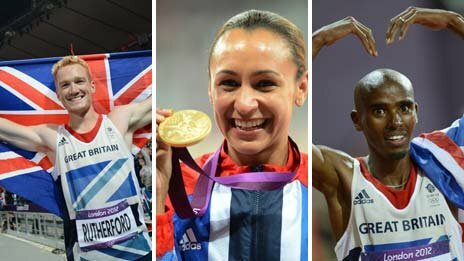 2012 has been a memorable year of athletics with London playing host to possibly the most exciting and most popular Olympic Games in living memory. Like any year there have been some jaw dropping performances, shock results, with a sprinkling of controversy thrown into the mix. James Sullivan takes a look back at events from London and the rest of 2012 with the first of three parts to his A-Z of the 2012 athletics year. The attendances at the athletics events at London 2012 were nothing short of outstanding. For every single track and field session, whether morning or evening, the stadium was packed to the rafters, in particular for the morning sessions, where usually athletes are competing in front of an almost empty stadium. The Daegu World Championships were impressive last year with the crowds that attended the heats in the morning, but London has taken this to a whole new level. It must have been an incredible kick for lesser ranked athletes, those who got eliminated in the heats, to compete in front of 80,000 people, something which most certainly did not happen during the Sydney, Athens or Beijing Olympics. The support was excellent from the British public, particularly for those athletes who wore the GB vest. While many of the spectators inside the stadium were not particularly knowledgeable about the sport, this was not an issue, and no doubt some of the people in attendance will have been inspired to get involved in the sport as a result. What was particularly heartwarming was the unprecedented number of supporters lining the streets of London for the marathon and race-walking events. It is hard to make an accurate estimate of how many people were along the Mall and Buckingham Palace for the men’s 50k, but an approximation of over 100,000 would not be very farfetched at all, and the atmosphere was among the most memorable of all sporting events I have attended over the years. Overall, there has never been a better supported Olympic Games, and we may never see the likes of it again. It is inevitable that every athletics related A to Z will include mention of Usain Bolt. The flamboyant Jamaican has been track and field’s showpiece act over the last four years and by far the biggest draw for casual fans of the sport. However, despite his array of gold medals and world records to his name over the past four years, many believed that the showman from Jamaica was starting to appear fallible, illustrated in particular by defeat to his countryman Yohan Blake over both 100m and 200m at the 2012 Jamaican trials. However in London Bolt found an extra gear, defending his 100m title in 9.63, the second fastest clocking of all time, ahead of Blake, who claimed the silver medal in 9.75, equaling his personal best in the process, while disgraced former Olympic Champion, American Justin Gatlin edged out compatriot Tyson Gay to take bronze in 9.79. Seven of the eight finalists ran sub 10 seconds in what was unquestionably the quickest race in history. A few days later, Bolt returned to successfully defend his 200m crown, clocking 19.32, again pushing Blake down into the silver medal position in 19.44, a victory which was more convincing than the 0.12 margin suggests. Warren Weir completed a Jamaican clean sweep taking the bronze in 19.84. In claiming double gold, Bolt became the first athlete in history to win both the 100m and 200m in consecutive Olympics. It appears he will attempt to defend his titles at the next Games in Rio de Janeiro rather than look to move up in distance to the 400m. Whatever he decides the cameras will not be far away and the charismatic sprinter will be lapping it all up. We wouldn’t want it any other way! It seems that the Athletics Association of Ireland and controversy are never far apart and 2012 proved to be a depressing example of incompetence and inequity. First there was the harsh decision to omit Rory Chesser and Brian Murphy from the Irish team for the European Championships in Helsinki despite the fact they had comfortably reached the qualification standard for their respective events. What makes this total lack of justice all the more alarming is that the aforementioned athletes were originally entered to compete for Ireland and their names were listed on the EAA website only for somebody in the organisation to go to the unwarranted effort to ensure their names were removed from the competition start list. The AAI received considerable bad press which could easily have been avoided. But lesson learned right? Wrong! Only weeks after the Helsinki debacle, and yet another controversy had arisen, this time centring around the Irish women’s 4x400m relay squad which had brilliantly qualified to compete in the Games as one of the top 16 ranked teams in the world. One would have imagined from the outset that selecting a squad of 6 for London would have been nothing but a mere formality with the 6 fastest women gaining their ticket to London. However the AAI proceeded to make a complete hames of proceedings and selected the 7th fastest athlete Catriona Cuddihy over the 6th fastest Joanna Mills. Not only did Mills have a faster PB than Cuddihy but she also had a faster season’s best, had championship pedigree with a 4th place finish at the 2011 European Junior Championships, and aged just 19 had significantly stronger developmental potential than Cuddihy who is 6 years her senior. Whatever angle one looked at this there should only have been one winner. Mills rightfully appealed this decision with the original choice being overturned. The mess continued when Cuddihy counter appealed to the Olympic Council of Ireland who reversed the result of the appeal. The end result in all of this was that Cuddihy was selected to travel to London and an aggrieved Mills has since declared to run for Great Britain. The extent of her talent is not currently known and time will tell how much of a loss to Irish athletics this amateurish mess has caused. While London 2012 was filled with many unforgettable moments, there were nonetheless a few uglier instances which leave a bitter taste in the mouth. Many long term followers of the sport could say with a reasonable degree of confidence that the 2012 Games have been the cleanest in a long time, as anti-doping procedures are getting more stringent by the year. However, as always, there will be those who slip through the net, those who succumb to the temptation to take a short cut. A particular sad sight was that of Turkey claiming both gold and silver in the women’s 1500m, with Asli Cakir Alptekin taking victory, while her compatriot Gamze Bulut followed closely in second place. Cakir is a convicted drug cheat, banned from competition for two years in 2004 and in 2012 she ran a staggering 3:56, making an eye-opening 6 second improvement on her pre-2012 PB. Bulut, although very young at just 20 years of age, made an astonishing 17 second gain in the same time frame. What makes the performances all the more suspect is the sad fact that, as a nation, Turkey has an appalling history with regards doping, to the degree that it is very difficult for them to be taken seriously anymore. I’d like to think that these two ladies have now fulfilled WADA’s criteria for future target testing! The 21st European Athletics Championships took place at the Olympic Stadium in Helsinki between 27th June and 1st July 2012. These championships were the first edition of the new 2 year cycle for the competition, a change from every 4 years, and were without any marathon or racewalking competitions. In total 50 nations competed with 27 winning at least one medal. Germany topped the medals table winning 6 gold, 6 silver and 4 bronze, finishing ahead of a weakened Russia in second place, who won just 5 gold, half of their total from Barcelona two years earlier. Notwithstanding some impressive performances by the likes of Renaud Lavillenie, Mo Farah and Olha Saladukha among others, the championships as a whole were a pure disaster. Firstly there was the farcically tight bends which led to an embarrassing number of disqualifications in the sprint events due to athletes stepping out of their lanes, which rendered some of the events a complete farce. In addition, with the competition taking place just one month before the Olympic Games many of Europe’s top athletes rightfully chose to skip Helsinki to focus on the main prize in London, thus watering down the event and doing serious damage to the prestige of the European Championships, a competition steeped in history and respect. Such a championship deserves to be the sole focus of an athlete’s summer season, something which was very much the case when the event was staged every 4 years. But now, rather regretfully, every second European Championships will be seen by many as merely a developmental competition. The truth is that the 5 days in Helsinki had a feel of a European Under 23 Championships about it. The sooner the EAA revert back to a 4 year cycle the better. One of the more popular champions from London 2012 was the dynamic American sprinter Allyson Felix. The three time world champion over 200m finally claimed the Olympic title after consecutive silver medals over the half lap distance in Athens and Beijing. In the final she clocked 21.88 to easily beat the 100m champion, Shelly-Ann Fraser-Pryce, into second place (22.09), with Carmelita Jeter taking the bronze (22.14). The 26 year old American was one of the biggest winners of the Games claiming 3 gold in total (200m, 4x100m, 4x400m) and finishing 5th in the 100m final for good measure. While Allyson Felix’s 200m victory was expected, the complete opposite was true with regards veteran Felix Sanchez’s triumph in the men’s 400m Hurdles. The Dominican Republic athlete was once the dominant force in the event, claiming world titles in 2001 and 2003, Olympic gold in Athens in 2004 and remaining unbeaten for a staggering 43 races between 2001 and 2004. However in the last 8 years, notwithstanding a silver medal at the 2007 World Championships, Sanchez has been operating more at a top 8 level, consistently making finals but rarely challenging for ultimate glory. However that all changed at this year’s London Olympics where the 35 year old stunned the world by claiming gold in a lightning 47.63 seconds, his fastest run since his first Olympic gold 8 years earlier. Who says over 30 is too old to sprint eh? 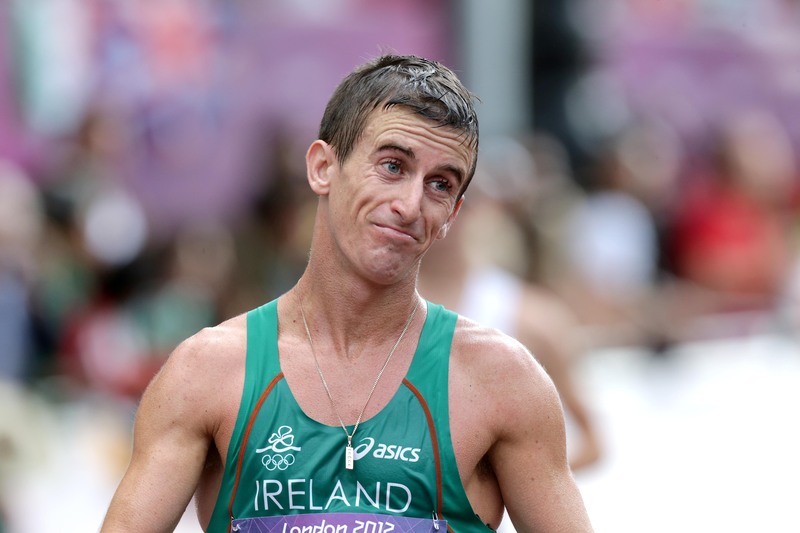 From an Irish perspective the unquestionable highlight of London 2012 was Rob Heffernan’s performance in the men’s 50k Walk. The Togher athlete has been a very reliable championship performer over the years, finishing 6th at the 2007 World Championships over 20k, 8th at the Beijing Olympics at the same distance, and 4th in both race walking events at the 2010 European Championships. After finishing 9th in the 20k at these Games, in what was effectively used as preparation for the 50k, Heffernan turned his attention to his main event, which took place 7 days later in front of huge galleries of supporters along the Mall and Buckingham Palace. Cheered on by remarkable Irish support and numerous renditions of the Fields of Athenry, the Corkman paced himself perfectly, electing not to go with the early leaders, and over the closing stages picked off tiring athletes in front of him one by one. Heffernan eventually finished in 4th place in a sensational time of 3:37:54, knocking 7:36 off his old Irish record, and was just 38 seconds behind bronze medalist Si Tianfeng of China. This clocking puts him up to 15th on the world all-time list, and would have been good enough for silver in Beijing and gold at every other previous Olympic Games. While he was no doubt disappointed not to come away with a medal, one gets the feeling that his time will come in Moscow later this year at the World Championships.